The Realtree AP Snow Lens Cover for Canon EF 180mm f/3.5L Macro USM Lens from LensCoat covers the lens with a 100% closed-cell neoprene coat, offering protection from bumps, jars and nicks. This coat allows you to blend in with your surroundings. It is useful for nature and outdoor photographers, as well as sports shooters and photojournalists. A LensCoat Lens Cover provides a thermal barrier, protecting your hands from cold lens surfaces in low temperatures. It is easy to install and remove, leaving no residue on the lens. It is waterproof, providing protection to your lens in wet conditions. 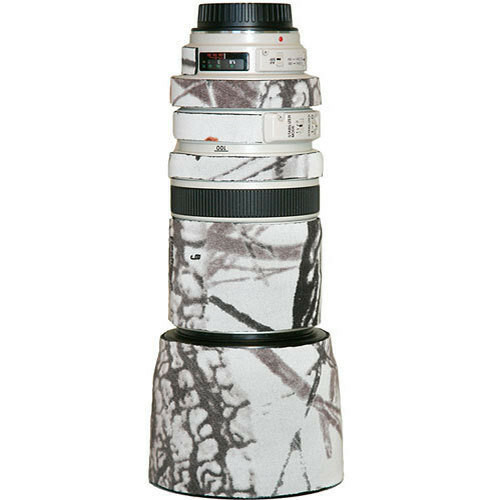 This version is white and covered with a subtle pattern of leaves and branches to help camouflage the lens when you are shooting in snowy conditions. Lens Cover for the Canon EF 180mm f/3.5L Macro USM Lens (Realtree AP Snow) is rated 5.0 out of 5 by 1.